As Leonard Cohen sang in his song Anthem, there is a crack, a crack in everything. That’s how the light gets in. Born of fire, millions of years ago, molten lava flowed and burned everything in its path, then cooled forming giant columns of basalt with natural inclusions in the stone. 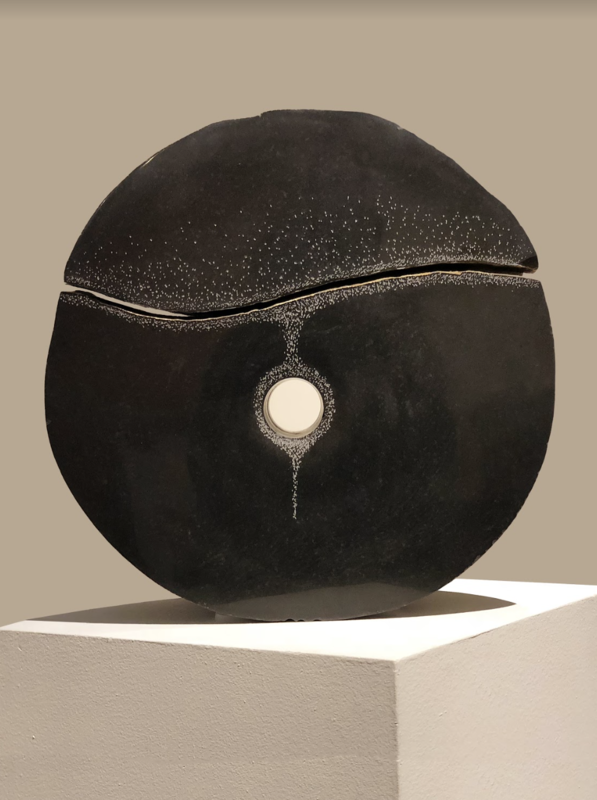 When I was carving this basalt sculpture, an inclusion released its stress and the stone split in two. My original plan was lost by the break so I abandoned these two stone pieces for a number of years. Last summer, while up in Washington at my former carving studio, I was looking at what I had abandoned and I now wanted to complete. I decided to bring this broken sculpture to Ojai and maybe I would have an new idea what I could make of it. It wasn’t until after the fire, while walking through my studio I saw the renewed vision. I saw the crack awakening new possibilities. This is how I felt after the Thomas Fire. The fire brought a severe split in the flow of my life and the lives of so many of us. It transformed what was… into the new. 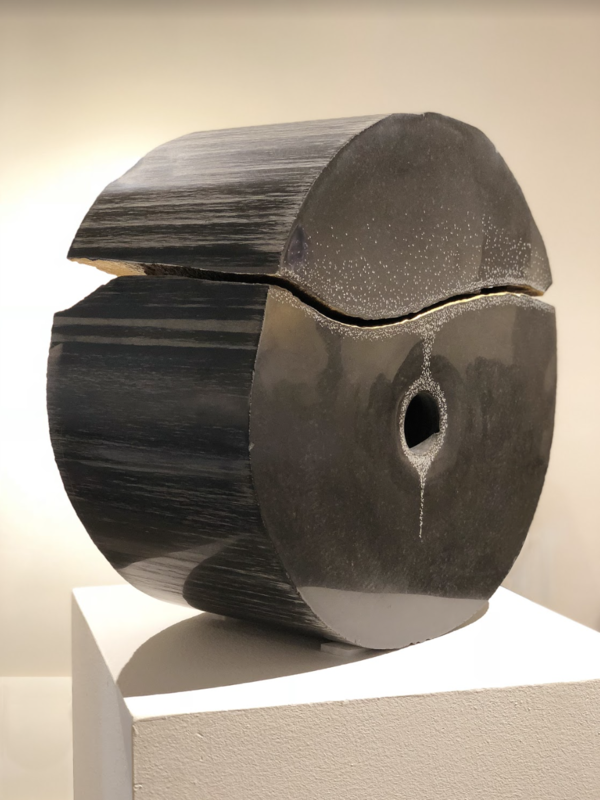 Peaceful and timeless – my sculptures bring to you the importance of stillness, serenity, and a peaceful presence. They instill a calm sacred space, an environment most valuable in these hurried times. I call my work Art for Peace. I am presently working with the sculptural mediums of cast glass, metal, stone, and 3D printing with the themes of inner and outer peace. These themes are based on universal values and represent evolutionary steps in our quest for freedom and inner peace. It is my intention that each sculpture brings healing and renewal to the times we live in, as well as a peace message to future generations. May we live compassionately and peacefully in the light of our one shared human family. My art comes from the depths of my unconscious where archetypes are brewed. When I visualize a sculpture idea, I often will model it in clay or wood or more often directly carve it in stone. Then I look to see if it is best cast in glass, welded or cast in metal, or computer designed for 3D printing. Often the direct stone carving captures the essence of what I want to express. This is the greatest joy for being able to visualize a form and then bring it into the world. I appreciate all the support I have received, so that I can do this work. In 2008, I received a grant from the Cultural Arts Foundation Northwest to do a residency at my glass studio in the Czech Republic. This studio has produced the works of Stanislav Lewensky and Jaroslava Brychtova, Howard Ben Tre, Karen Lamont, and numerous other notable glass artists. I created models for 5 glass castings while there. I then attended an International Art Salon in the Louvre, Paris having been selected by Societe Nationale Des Beaux-Arts, to exhibit by Genesis Glass sculpture, a symbol for peace and reconciliation. In 2013, I had a vision for creating HOLOS, a 9 spiral torus geometry. This design came to me in a meditation, like a gift. I was the instrument for bringing it into form. This design has been seen by many but no one has sculpted it into a 3 dimension form. Physicists have referred this design as the Universal pattern of creation. I saw it representing the unity of our human family with all our differences. This design transformed and focused me to life my life, as a peace builder. I am honored to bring such beauty and messages of peace to the world.